DUO TONE MODERN VASE home decor, jewelry, decor, decorations, electronics, fountains, floor mats, art glass, vases, garden essentials, fireplace screens. 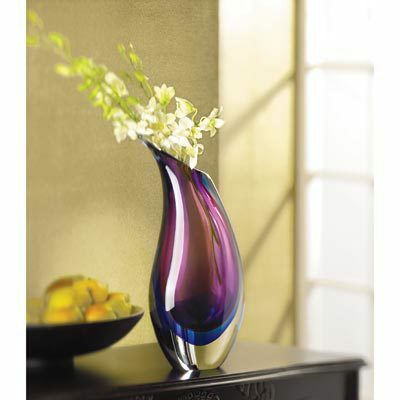 Resplendent in hues of violet and indigo, this magnificent glass piece with flowing patterns of color stands alone as a perfect sculpture or as a stunning receptacle for your favorite bouquet! Material(s): GLASS. Weight 12.8 pounds. Dimensions 7" x 4" x 15.8".